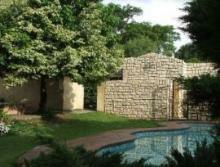 Amanzi Stone Cottages .... is about quiet comfort and a relaxed lifestyle in your own private light-filled cottage. Each of the three modern sunny private self catering cottages is ideal for longer stays. Whether on business, relocating, or just visiting, Pamela always ensures that your accommodation is as comfortable as possible. Offers modern, chic comfort with a fully equipped kitchen, open style bedroom and bathroom, separate toilet, wooden flooring, sandstone tiles, earthy colours and textures in a modern style. Offers contemporary comfort with wooden floors, a neutral calming palette, fully equipped kitchen, skylight in bathroom, a bedroom opening to soothing water feature and a tranquil silver birch treed private garden. This spacious cottage has two bedrooms, full bathroom, open plan lounge and kitchen area, French doors off lounge and the main bedroom opens to a charming garden with a soothing water feature. Ideal for the small family relocating! * All cottages are serviced daily, except Sundays.